The last person to give evidence for the Post Office at the Common Issues trial was Brian Trotter from the Post Office. You can read his witness statement here, or below. You can read the write up of the last day of Post Office evidence in court here. Witness statement from Michael Haworth, who gave evidence on the last day of cross-examination of Post Office witnesses in the Common Issues trial. You can read his witness statement here, or below. Live tweets start at 10.30am from court 26 of the Rolls Building. Nine minutes to go before Day 11 of #postofficetrial gets underway. Very few members of the public in court today, none of the regular claimants (except Alan Bates). A full complement of claimants lawyers but no one at all from the Post Office - visitors or lawyers. I have seen them, they are here, but not in court yet. I think there are at least three Post Office witnesses due to be cross-examined today. We’re also going to get a closer indication of when the third trial in this action will take place (possibly October 2019). The first 13 minutes of today’s proceedings have just been taken up with an application I made to the judge. I just had to address him in open court. He has made an order allowing me to receive daily transcripts of the trial…. … which will make my reporting of proceedings going forward much easier as I will be able to provide you with direct quotes from the day on the day as well as live-tweeting my notes. Michael Haworth is in the witness box. He has been sworn in. He is a Network Engagement Manager for the Post Office. He is being asked what happened during his interview with Mohammad Sabir (lead claimant) when Mr Sabir was applying to become a Subpostmaster in July 2006. We are focusing on a checklist which PO interviewers say they used to tick off all the issues they needed to cover with Subpostmaster applicants. Patrick Green QC for the claimants is putting the questions. QC is testing MH's claims that he has seen interview checklists which are the same as his colleagues Elaine Ridge and Brian Trotter. QC establishes that this claim is based on MH's imagination. QC would it surprise you that Mrs Ridge told us she didn’t cover the 3 month notice period? … on your imagination. And what you think she would say in interview is based on your assumption? QC during interview, would you have mentioned suspension? QC so if there’s anything significant that everyone should follow, an ACC would be sent round? MH that would have been after the time I interviewed Mr Sabir. MH accepts he didn’t do this, and that he wouldn't expect or imagine other PO interviewers to go through these elements. Judge questions final point - asks if MH would tell applicants they would have to accept a debt (by settling centrally) before rolling over. MH says he was not aware of this. We are back to the summary of terms and conditions which applicant SPMs are asked to sign which contains S12:12 of the contract, but which also tells applicants that the summary cannot be relied on for any purpose. QC do you know why it says this? MH I would tell them any losses (and I gave examples of what could cause them in my statement) would result in a discrepancy and they would be expected to make them good. QC Mr Sabir says he can’t remember any contractual matters being discussed of the sort you say you would have gone through. Either you didn’t discuss them with him? Is that possible? … in interview is much less than the business plan. MH does not accept this. He says he would have given it equal emphasis. QC Mr Sabir was very clear he was not advised to take independent legal advice. You says you always tell SPMs get independent legal advice. are you sure you did with mr Sabir? QC would you tick this off on your checklist? MH no but I would have covered it off. We have gone to one of Second Sight’s reports from 2014 which says it has not seen any evidence that applicant are advised to get legal advice. Then QC goes to PO rebuttal which says PO is not under any obligation to suggest getting legal advice. its own, Contract Advisors, you, were advising applicant SPMs to get legal advice. MH doesn’t know but reiterates that’s what he did do. Now onto a document Michael Howarth co-wrote containing an operational level agreement about a dispute over Transaction Acknowledgements. It is last marked as reviewed in 2012, but MH does not know if it has been updated since. QC says MH lays out in the document the meanings of things like settling centrally. Which means a discrepancy is accepted as a debt, subject to them disputing it by calling the helpline. MH does not know about this side of things. Back to MH authored document in which he says PO acknowledges the stress of a large discrepancy appearing in branch balances. MH does, but says he doesn’t know what the current situation is, with his change of role. QC goes to Mrs Stubbs situation in 2010 when she was told she could take her “debts” of the balance sheet whilst they were being investigated. MH can’t remember much about this process. QC going back to Pam Stubbs witness statement in which she is told by the helpline to put the money in to make up the balance in the expectation a TC would come to them down the line. Do you remember this sort of thing happening? QC did you ever request them? MH not that I am aware of. J as a query, as a dispute or what? QC which SPM had voluntarily accepted? QC to help them understand how it worked? correction - I previously called a PO OLA an operational level agreement. it is an organisational level agreement. We are looking at a PO internal document about improving error reporting, information flow and cutting losses and recommendation all data should be kept for 24 months rather than the 61 days in branch. This document notes that the Post Office has spent £324,000 on 720 ARQ data requests from Fujitsu re Horison at £450 a pop. QC asks if there is therefore some resistance to asking for these to assist an investigation because of the cost. … of that being the case. QC when would you get it? QC and when would you get that? We are taking a 10 minute break. Not sure why you needed to know that. Going through a PO FSC document which describes the process of writing off losses and which part of the PO takes the hit depending on what sort of loss it is. QC did you made a decision as a CA to write off a discrepancy? QC have you ever reinstated someone? QC who makes the decision to write off any unexplained discrepancy? MH don’t know. above my level. JFSA QC has finished. PO QC David Cavender on his feet for a re-examination. PO QC asks about some evidence by Elaine Ridge - picks up from the transcript on Day 10. It was said to you that EL couldn’t remember 3 months notice. Now you see what she actually said. MH yes. as far as I remember it was covered in all interviews. Sorry - that was with specific regard to PO interviewers advising applicant SPMRs to get legal advice before signing. MH is saying this would have been covered in every interview. J would you explain that to them? J have you ever been asked what “something untoward” means? J asks about MH’s example of double keying a zero. MH explains that I customer might give you £90 and you key in £900 and give the customer a receipt for £900. But only £90 has gone into the till. You are liable for remaining £810. Judge understands. Moves on to next point. You say you always explained that SPMC was long and detailed and it was important to take independent legal advice. Would the SPMs have that document at that time? J would you have it with you? J when did they get it then? MH my understanding is that it would be sent to them when application was succesful. Michael Haworth is done in the Witness Box. Next witness has been sworn in. Andrew Carpenter Agents Contract advisor. QC asked how many interviews he does a year. QC when did you notice this? QC did you ever think it would take place in her branch? QC so why does it say it did in your signed witness statement? QC do you still use a checklist? QC do you have your own checklist? QC you don’t have any old checklists any more. QC establishing the process for explaining the need for a minimum of 18 hours behind the counter (not with all contracts) to qualify for holiday and sick pay. MH explains how this works. QC asserts that any agreement to work a certain number of hours would be notified to the Post Office, but would not form part of the agreement with the SPMC. … her business plan, her character, her enthusiasm, but notes it is High Risk, but adds there is a low start up cost and has parents willing to help financially. Why flagged as high risk? QC would you go through your checklist after the biz plan (BP) discussion? QC so what could throw a spanner in the works…? MH interview is centred around the presentation and BP. Once all that area is concluded that’s when I’d move on to the checklist. QC would she have it with her? QC goes back to witness statement and how AC would raise the 12:12 issues - you would have explained errors by your or your staff made SPMs liable. QC because they wouldn’t be liable for a PO mistake? Judge would you discuss PO errors in an interview? AC isn’t clear what he’s talking about. QC shows him a document. Do you see the diagram. Processing Options [presumably for Horizon]. Seek evidence. If it’s not available it goes to Do You Want To Accept TC Now? Everything is fixed and we’re back after lunch. Andrew Carpenter, Post Office Contract Advisor (AC) is in the witness stand. Patrick Green QC is asking questions for the JFSA. QC asking what documents AC has seen to refresh his memory of interviewing Liz Stockdale (lead claimant) - (his witness statement says he’s seen a number of documents). asks who he was shown them by. AC now saying he isn’t sure what documents he’s seen. QC showing him some documents to see if they might be the documents he was shown. AC they are looking at it. it is a checklist of his interview with LS. QC wants to go through this denser document, I think (remember I can’t see any of the documents they are discussing) and asks about things he has checked off. QC says in your WS you says you would have discussed fraud - would you have spent much time on it? QC would you have not discussed it all? … definitely would have discussed it. QC how does the PO office process transactions as far as you understand it? Would you have said anything about it to LS? …. and enters into Horizon. it doesn’t just stop there does it? QC would you discuss that with LS? AC no it would be too much detail. Now onto post-suspension exchange of communication between Andrew Carpenter and Liz Stockdale. She was suspended. She emailed asking about her rights to appeal. He sent her a standard letter confirming her suspension. She emailed a month later having heard nothing. She emailed another 4 days letter. She wants to know why she hasn’t been contacted. QC you could have told her this, couldn’t you? AC I was being advised by the PO lawyers. QC notes she was being asked to hand over any information that LS might have to support her investigation into her losses. But she was not being given any information at all about what was going on during her suspension. … she was later audited, and with a £7K discrepancy suspended, investigated and terminated…. … erroneous understanding (which LS claims she had been told by another PO employee). AC I think we limp to a conclusion that he may not have done anything specific on that. PO QC on his feet. He asks AC to explain the amount of information that would have been available to LS whilst the discrepancies built up. AC does this very clearly and says there would have been a lot. Judge wants to know about total debt on day LS was suspended. What did AC understand on LS’s ability to settle centrally. AC no block on her settling centrally. She would have had the options that she always had. My understanding is that she wouldn’t be able to request..
… a repayment plan. But she could still settle centrally. J so if she gets a £5K discrepancy whilst she’s on a repayment plan and she settles centrally what happens. J were you part of the suspension of LS? J were you aware she was already a claimant when you recommended her suspension? AC no. But I found out pretty quickly the same day. PO QC back on his feet asking about settling centrally. If LS had a £5K discrepancy, but couldn’t request a repayment because she was already on repayment. What happens? Could she dispute it? AC yes - through me. PO QC what about the role of the helpline in this? AC the helpline would allocate this dispute to whoever would be the most relevant. J if someone buys a postal order and its cashed elsewhere in another Post Office - that does not involve any external clients. AC I’m on the spot. I can’t think of one now, but I might think of several later. J don’t worry it’s fine. It was just for personal interest. Judge rises. 10 minute break. Brian Trotter, last PO witness in this trial has been sworn in. He is a Contracts Advisor. The PO QC is taking him through the transcript of an interview by he undertook with Louise Dar (lead claimant) when she was planning to become an SPMR. PO QC asks BT why he didn’t deal with the third part of the inteview dealing with contractual matters. BT there was no point as her business plan didn’t stack up and I told her that. QC were you provided with it? QC moves on to what he says in his WS about the Business Plan not being approved by the finance team. Why have an interview if the BP had not been assessed as financially viable? BT it was approved for interview. QC so your witness statement is wrong? QC is it because you need a reason to explain why you didn’t go through the checklist of contract with Louise Dar? QC why are you being evasive Mr Trotter? … for you saying in your witness statement that you covered the checklist in LD’s interview and yet the transcript of the interview you didn’t. QC that’s not how this reads. QC your WS says you always follow a structure, and we are given a checklist. And we have this document - which shows interview notes and a checklist. With contractual status. With a tick there. This is the file which relates to the first interview. BT it’s undated I’m not sure. QC But this is something you exhibited before the transcript of your interview was disclosed. and with the date on the front being 9 Dec, it looks like it referred to the same date. QC and yet the transcript of this document makes it clear you didn’t discuss these. BT is getting a bit don’t remember-y here. … formal assessment here, did you? Quotes BT saying in a memo he doesn’t intend to file a full assessment. QC did anyone ask you to? QC she expresses some concerns about training? BT at that point I would clarify about the various modules as you can see I did. “I’m looking for comfort here…. we’re looking for comfort. It’s me who is making the decision…” see that? QC quotes BT from transcript: “And I’m just trying to advise you, because you’re the type of person we want." QC also quotes BT saying “I’m just trying to advise you.” and LD saying “You know best." QC suggesting the Post Office wanted a Post Office branch in Lenzie. BT I told her she was a very strong applicant. QC and in the light of that you encouraged her to apply? BT [pause, and then in a slight yelp] Yes! QC LD says you encouraged her to apply and she also said in her witness statement (before she heard the transcript) that you discussed legal advice and she got the impression that she could trust BT. … she take any legal advice? BT she was taking a lot of advice from her father. I remember that. … that in this instance you didn’t go through the checklist. BT I don’t recall going through the checklist. QC then why didn’t you make that crystal clear in your witness statement? PO QC on his feet to clarify a point. Judge asks about a document which the JFSA QC can’t find so he won’t ask Brian Trotter any questions. … raise wrt to previous witness. We have finished Post Office witnesses. We are now discussing closing submissions. Judge orders QCs to get them to him by Friday noon. Judge also wants an agreed list of common issues which doesn’t refer to specific pleadings. It has to be a stand alone document without any specific pleadings. “I’ve got pleading references coming out of my ears." Judge now asking about interview with Liz Stockdale which the Post Office recorded, encrypted and now can’t get into. Judge wants to know the extent to which any effort has been applied to unecrypting it. Judge points out that it might not have much wider relevance to the common issues but it may have a bearing on Liz Stockdale’s individual case. Judge that’s what I’m inviting you to have a discussion with me about. Judge my experience is that when it comes to disclosure at the first look someone says something is encrypted and can’t be unencrypted and then when specific focus is brought to bear, ways are found. … witness statement in some detail as to why it was not possible, unless there is anything you are about to tell me as to why I shouldn’t. PO QC my lord we are in your hands. JFSA QC now pointing out that something appears to have changed on the NFSP website since Mr Beal from the Post Office was cross-examined on the NFSP on 15 Nov.
JFSA QC notes that the About Us page on the NFSP website has been changed to add a link to the Grant Funding Agreement which the JFSA QC has suggested was not that obvious when he cross-examined Mr Beal. Judge has ordered disclosure of any emails to, from or which have been copied to Mr Beal between the Post Office and the NFSP which in any way concern a change to the NFSP website re the Grant Agreement, by noon Wednesday next week. Judge says there are three orders made today - the one concerning Mr Wallis, the one about Mr Beal and the one about getting Ms Stockdale’s interview recording unencrypted so it can be transcribed and we can find out what’s in it. The latter two have just been discussed. The former was an application I made this morning, which has resulted in the judge ordering I be given the daily amended transcript as soon as it is made available to both claimants and defence at the end of the working day. That’s it for today’s live tweets AND for this week, but I will be posting up interesting documents as the week goes on. … of have found it useful, please chuck a couple of quid in the tip jar at postofficetrial.com which is where new documents and contextual articles will be published. I’ll get you a write up of today by 9.30pm. And PLEASE REMEMBER nothing in this thread is a direct quote unless in direct quotes. I did not expect to be addressing the court myself this morning, but at the invitation of the judge I was asked to explain why I had asked to make an unofficial audio recording of court proceedings for note-taking purposes. The judge asked why I didn't have the daily transcripts. I replied I had made repeated requests and so far had not been given them. all of this is transparent and public justice". "I am very grateful, my Lord." I will post up the full exchange in due course, as it may be useful for journalists applying to the courts for a contemporaneous record of proceedings. Once that had all got out of the way we had the first of three Post Office witnesses, starting with Michael Haworth, a Network Engagement Manager who has been with the Post Office for 39 years. Most of today was focused on what Post Office interviewers would say to Subpostmasters when they were being interviewed as against what they did say. Particularly what the conversations they had with some of the six lead claimants. There is some considerable disagreement between the claimants and the Post Office about whether or not they received their contracts before they started their jobs (many claimed to receive and sign summary terms rather than the full contract) and whether the full extent of their potential liabilities with regard to Horizon discrepancies were ever fully explained. Since 2006 it has been Post Office policy to record applicant interviews. Before that a checklist was relied on. Because a lot of interviews took place a long time ago (notes are lost, memories fade) and because many Post Office interviewers conduct such a huge number of interviews during the course of their duties, their witness statements often contain no direct recollection of what happened with specific regard to the experiences of the lead claimants in this trial. "I was not often asked any questions about these documents on the day of a transfer audit. Having done several hundred audits, including transfer audits, by September 2006, I was very familiar with the documents that needed to be signed and believe I would have been able to answer most, if not all, questions myself ." KD: ... If asked what are postal instructions, what would you have said? MW: I would have had to refer that back to either our HR department or the contract advisor. KD: Are you aware that as at 2006 the way the contract itself, the Subpostmaster contract, was presented, it had on the front about 40−odd pages of variations on the front? MW: No, I am not aware of that at all. MW: No, no. It wasn’t part of our job at all . KD: If they had, would you have been able to answer? MW: If anybody had seriously... and I honestly don’t think anybody has asked me any questions about the transfer papers at all, I would have had to refer it back to the people who were involved in the contract, the contracts advisor. KD: ... Had you ever read the contract? MW: No. It is really not part of our job." with other areas in the interview checklist"
witness statements of Elaine Ridge and Brian Trotter." her own personal one. How do you know what was in hers? MH: I don't know exactly what was in hers. from checklists that had the same items in them. MH: No, we were talking about the competency questions. checklists used by the others. MH: That is correct, my Lord. MR JUSTICE FRASER: Mr Green asked you if you had seen the checklists used by the others and I am a bit confused as to whether your answer to that is yes, you have seen them, or no, you haven't. other contract managers at that time. MH: I haven't seen her personal checklist, no. QC: So you are not able to say that you were using the same checklist as Mrs Ridge, are you? MH: I can't say definitely I was using the same list but I would imagine it would contain the same key points. QC: So it is based on what you imagine? ... I would have to remember to say it and I always said it"
to which Mr Howarth said "I would expect that, yes. Mr Green drew Mr Howarth's attention to a Post Office rebuttal document produced in 2014, used to oppose the conclusions of Second Sight, the independent investigators it commission to investigate Horizon. Second Sight had said: "We have not seen any evidence that Post Office either advises or requires subpostmasters to seek independent legal advice before taking up their posts." to take legal advice on the contract at any time." advice, why would Post Office not know that in 2014?" Mr Howarth did not know. Next up was Andrew Carpenter. Another long time Post Office employee. Mr Carpenter's evidence did not start well. Like Mr Haworth, he interviews applicants for the Subpostmasters role and Mr Green QC wanted to ask him about his witness statement. Mr Carpenter could not remember interviewing Liz Stockdale (a lead claimant), but it did say in his witness statement that he interviewed her in her prospective branch in Sandsacre, East Yorkshire. having the interview at Sandsacre branch, or not really? AC: The interview wasn't at the branch, it was in Leeds. QC: Was it last week or today or...? AC: I don't know, in all honesty. QC: Do you know why you didn't ask to correct that? QC: Because when you wrote this you couldn't even remember where it was, could you? QC: So you would never have thought it was in branch? you, it says that it was, or appears to? The close reading of the witness statements continued with Mr Brian Trotter, another long-serving Post Office employee who interviewed Louise Dar (a lead claimant) about her job. to get to the third bit. QC: Can you tell me why that is? cover the contractual reference during the interview. interview that was still available? BT: I was aware there was a recording. QC: Were you provided with a transcript of it before you made your witness statement? QC: Did you ask for it? In his witness statement recollection of interviewing Louise Dar, Mr Trotter seems to assert that he had gone through everything on the checklist in his interview with Mrs Dar. But then the transcript of the interview came to light, and he clearly hadn't. QC: Why are you being evasive, Mr Trotter? the tape shows that you didn't? Is that what you feel anxious about? Mr Trotter then asserted the checklist he produced for his witness statement, recording subjects covered in the non-existent third part of his interview, was actually referring to a second interview that he held with Mrs Dar. Mr Green then produced evidence of two checklists. One which supposedly referred to the first interview and a second referring to the second. In general quite a few Post Office witnesses have given evidence around the subject of what should be done and what therefore would have been done. Mr Green has made a fine art of pulling many of those assertions apart to at least expose the possibility (and at most, factually demonstrate through disclosed evidence) that what actually happened must have been wildly different from those assertions. This is a tricky enough prospect at the best of times because quite a few of the specific cases we are talking about happened a long time ago (2001 - 2003 being the earliest), but if the claimants are going to be successful in this litigation, they have to show that on the balance of probabilities, that at least one of the 23 issues that have been addressed in court over the last three weeks are relevant to every claimant. That is a tough ask, and one the Post Office's QC David Cavender has already indicated is going to be highly difficult. The Post Office believes this legal action "lacks merit", and is vigourously defending the claim. The trial continues on Monday 3 December with four full days of closing submissions. I'll be there. 1) The Post Office's admission it has bet the farm on Horizon. On Day 1 of the trial (7 Nov) the Post Office says in paragraph 3 of its opening submission that this legal action by the JFSA represents an "existential threat" to its entire business. Let's just repeat that, this legal action by the JFSA threatens the existence of the Post Office. News editors take note. 2) The Post Office CEO's demand to her staff via email that she "needs" to tell MPs there is no remote access to Horizon. This arose on Day 9 (21 November) during Angela van den Bogerd's evidence and you can read about it here. 3) The apparent admission by Helen Dickinson, Security Team Leader at the Post Office (Day 9, Wed 21 November) that she believed some Subpostmasters had been prosecuted simply to get a Proceeds Of Crime Act order, which enables the Post Office to take a Subpostmaster's assets to the value of a Horizon discrepancy. You can read about that here. 4) The moment on Day 8 (20 November) when Angela van den Bogerd, Director of Development and the most senior Post Office witness, said she didn't feel able to comment further on a piece of evidence because she was "coming to it cold". This caused some consternation amongst the JFSA's legal team. They told Mrs van den Bogerd that they had only recently received her signed witness statement for the Horizon trial, and in it, she dealt with this specific piece of evidence. Mrs van den Bogerd then admitted her statement to the court about coming to the piece of evidence cold was "a mistake". Read about that in the Day 8 write-up here. 5) The repeated assertions in passing by Post Office witnesses that Subpostmasters are liable for ANY losses in their branch, and the repeated assertions in Post Office literature that Subpostmasters are liable for any losses in their branch despite, the JFSA's QC taking quite some considerable amount of time to demonstrate (and have other senior Post Office witnesses agree) that this was contractually inaccurate. Subpostmasters, as we now know, are only liable for any losses in a branch caused by their own or their assistants "carelessness, negligence or error". Read the live tweet notes on Day 6 (15 Nov), Day 7 (19 Nov), Day 8 (20 Nov), Day 9 (21 Nov) and Day 10 (22nd Nov). 6) Patrick Green (claimants' QC) comprehensive trashing of the National Federation Subpostmaster's supposed "independence". You can read about how that came up in court as the last point in my write up of Day 6's events here, the NFSP General Secretary's "signed in blood" email here, and my subsequent comment piece here. 7) The release of an internal Post Office document on Day 1 (7 Nov) of the trial called the Receipts Payments Mismatch Meeting Memo outlining a serious Horizon error which had been going on for 5 months, the fact no Subpostmasters had been informed, the number of branches involved, and the proposed methods for fixing it, one of which involved remotely accessing branch accounts. Read it here. 8) Elaine Ridge, the Post Office Contracts Advisor who suspended Lead Claimant and former Croydon Subpostmaster Naushad Abdulla telling the judge, the Hon Mr Justice Fraser, that a spreadsheet containing information about the source of some of Mr Abdulla's discrepancies would not have been of any use to her in deciding whether or not to recommend Mr Abdulla for termination. Read it in the Day 10 (22 Nov) live tweets. 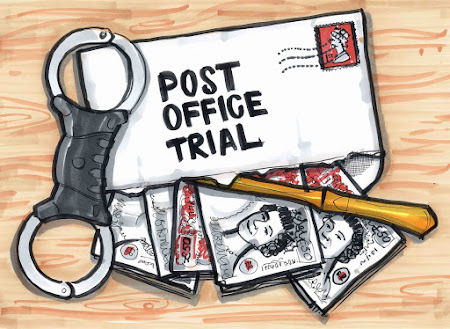 9) The Post Office being unable to defend its rather quaint practice of not allowing a suspended Subpostmaster to have a lawyer present during a post-suspension interview (Elaine Ridge: "it's just the way it is"), despite agreeing that a) during that meeting Subpostmasters could be accused of the criminal offence of false accounting, and b) the taped interview could be used by Post Office as evidence to support a prosecution. Read it in the Day 10 (22 Nov) live tweets. 10) Evidence from Louise Dar, Lead Claimant, that she was told to: “get around” Horizon by altering stock figures to balance, something she said "was obviously not helping me to find the specific problem, and was just covering it up. They told me they ‘shouldn’t be doing this’ but that this was the only way around the problem I had. This felt wrong and it was concerning to me that there were little ’work arounds’ to dealing with the Horizon system, this really suggested that there was some kind of fault in the system." Read Mrs Dar's witness statement paragraph 118, and see my live tweets on her being challenged on this on Day 5 (14 Nov) of the trial by the Post Office's QC, Mr David Cavender. Bates v Post Office: Did the Post Office prosecute Subpostmasters in order to seize their assets? On Day 9 of the Common Issues trial (21 November 2018), there was an exchange between Patrick Green, the claimants QC, and Helen Dickinson, Security Team Leader at the Post Office. In her witness statement Ms Dickinson neatly explained how Subpostmasters find themselves in a pickle with Horizon. "In my experience, a large majority of Subpostmasters are honest. Those that do commit acts of dishonesty are not necessarily "bad" and often don't have histories of dishonesty.... when completing their accounts, the Subpostmaster might record that a shortfall has been made good, without actually putting in the missing cash. This may be for something like the simple reasons that they have been unable to go to the bank to draw out the cash...."
"... at the next accounting point, the shortfall has grown, now bing the accumulation of the unsettled shortfall from the previous month and anything accrued in the current month. The shortgall to be made good is now larger and nobody and Post Office has noticed the shortage in the cash so the Subpostmaster does the same again. Throughout they are rationalising to themselves that they will correct the inconsistency later. This sequence continues for many weeks or month until the shortfall is so large the Subpostmaster can no longer afford to pay it. Also the accounts are now in a muddle because to cover up unpaid shortfalls, the Subpostmaster has to make more and more false entries in the accounts, eg by inputting false cash declarations. By this point it may be very difficult to separate the false entries for the real ones or, more importantly, to separate a loss caused by a genuine error and one caused by a false entry." We know a number of Subpostmasters have been criminally prosecuted by the Post Office for false accounting and chased for their discrepancies under the Proceeds of Crime Act. It is something that Helen Dickinson herself as done. Ms Dickinson seemed like quite a nice person, if not one of the brightest tools in the box (she is a business fraud investigator and had never heard of the Enron scandal, one of the biggest business frauds of all time), and surprisingly incurious about what might be causing losses (she claimed to know very little about Horizon or how to interrogate it). Her job was to help get a prosecution of a Subpostmaster, and then go after their assets. The problems they may have had with Horizon didn't seem to concern her. "Were there cases referred to the investigation team so that you could trace their assets through POCA?" This quote has not been checked against the agreed, signed-off transcript, and even then, the meaning might be ambivalent, but one interpretation of this question and answer was that Ms Dickinson was admitting that the Post Office sought criminal conviction in order to take Subpostmasters assets. If that is what Ms Dickinson meant, m'learned friends at the Criminal Cases Review Commission might have one or two things to say about the convictions of 30 Subpostmasters they are currently considering. Bates v Post Office: Internal Post Office email chain "she is questioning the integrity of Horizon"
"I think we need to... go and see what the ex-spmr is holding. I think this is going to be a very onerous task, but I can't see how we can let this one go considering she is questioning the integrity of Horizon."